Okay, so Tyga may not be donning the candy cane suit and white beard. And he’s about 50 pounds lighter than ol’ Saint Nick, (and who knows if he’s the right complexion for the part) but the spirit, the giving spirit he exhibited at the Children’s Center for Cancer & Blood Diseases of L.A. Children’s Hospital this past weekend was shown throughout. The Young Money rapper TYGA (acronym for Thank God Always) took a break from fiancee and Kim Kardashian’s bestie Blac Chyna to visit his No. 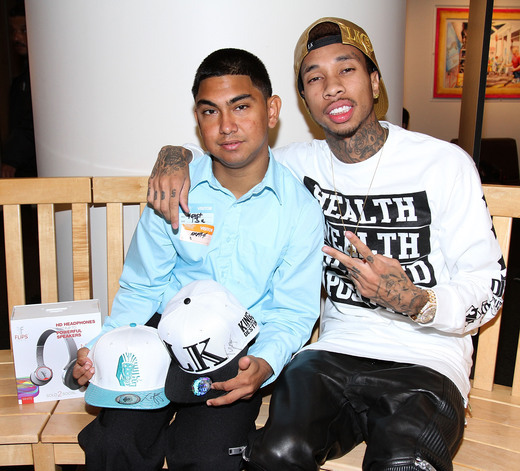 1 fan Isael Gomez, a 16 year old in need of a kidney transplant. Not only did the “Still Got it” lyricist surprise Isael with his presence and rallying support to find a donor. But PRESENTS, yes kiddies, Christmas presents. And what did Santa Tyga bring Isael and the other fifty-nine kiddos? Why, the joy of music of course. He gifted them with Flips Audio headphone X speakers, Music Bullet Speakers along with clothing from his company Last Kings. By far the best gift. ….Meanwhile in Oklahoma City, OKC baller Russell Westbrook’s Why Not? Foundation hosted a Christmas party for foster children in his native city. 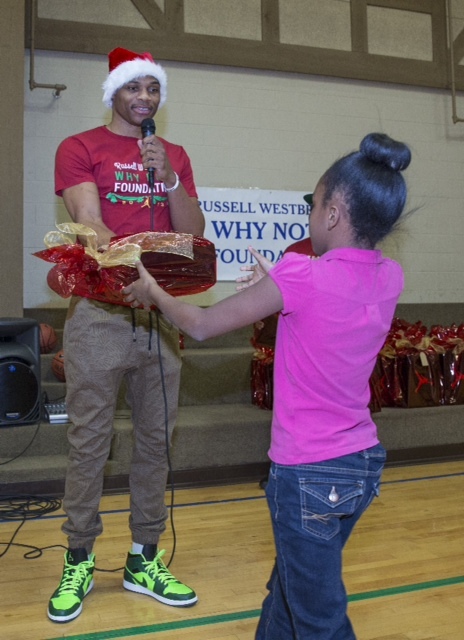 Russell Westbrook granting a Christmas wish. He teamed up with Citizens Caring for Children, a non-profit that provides clothes, shoes, books and other essentials for kids in state custody, to hand out gifts and brand new shoes. I guess Tyga isn’t the only one playing Santa, at least Westbrook rocked the hat.